Spam your site to thousands of blogs? I just received this awful spam from advertise-bz.com asking if I’d like my ad on 2 million websites. Obviously this is a garbage email selling a spam product, and having your ad on 2 million websites isn’t quite the way to go about Internet Marketing. – What if you could place your ad on all these sites ? Opening the html attachment takes you this website which is another of those shite sales letter sites. Within 2 days I had more that 1,000 pages linking to my website – my website’s traffic literally exploded. Your software is great! You have redefined the word “advertising”. More than 1,000 links within 2 days? Sounds great eh? Sadly, if your site were to get more than 1,000 links in within 2 days you’d trip Google’s ever so clever and alert spam filter which could very likely end up with your site banned. 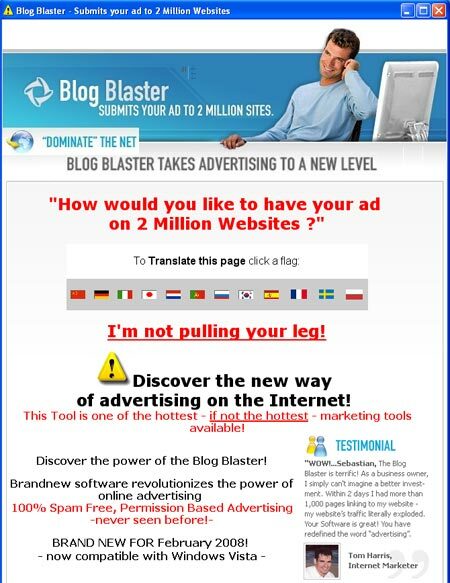 But by all means, use this blog blaster software and knock yourself out.